SNL's lead-in saturday night was Charlie Sheens's vstream webcast that aired at 10 PM, EST. However, if you tuned in around 9:50 PM because you were nervous you weren't going to get a spot (the internet can't be THAT big, right? ), you would have seen a closeup on a corner in one of Sheen's rooms and you would have heard lots of distinct noises of flatulence (recorded ones, but still). As to what exactly happened when things got started, nobody's really sure. Charlie took several cues from late night talk shows, and adorned his desk with index cards that told him what he was to talk about, thanked his sponsors, showed us inside his desk (that was filled with cigarettes, Twizzlers, and gum balls), and took a picture of himself and signed it for one of his fans named Josie. He also revealed a new tattoo on the inside of his wrist that says "Winning," and even did a segment where he listed people (and animals) that were "winning," like an eagle that had crashed into a windshield and survived. On more than one occasion, he dabbed sweat off his face and was confused about whether or not he had talked about something already (his amigos had to tell him that yes, he had in fact told us about the bald eagle who's "winning" when Sheen couldn't be sure). Only one of the Goddesses was in the room with him (Natalie), and together, they informed us that the other Goddess, Bree Olsen, had returned home to take care of some family business, but that they missed her. So yes, it's clear that Sheen realizes we're drawn to him. More than 100,000 tuned in to watch Sheen and his friends in fedoras, but if you stayed around long enough, you would have seen the number of people watching drop to around 91,000 Many people on Twitter were shocked that the fascinating and interesting guy we'd spent watching over the past few weeks could be so boring and erratic. None of what he did last night was new -- he didn't come forth with any new slogans or witticisms (which was probably what more than 100,000 people wanted most from the thing anyway) and when he was talking about how he was the "light on the tip of our light sabers," Sheen's music guy said that he liked that phrase but then Sheen told him to calm down because he'd said that before. The bottom line now is that Sheen has realized we're interested in him and his vstreams (even though he now says "Last night was treasonous to the movement"), but the even bigger bottom line is that we're slowly realizing he's not that interesting. The forgettable 50-minute webcast, dubbed "Sheen's Korner," featured Sheen and a group of his misfit pals, including "goddess" girlfriend Natalie Kenly.With more than 100,000 viewers tuning in, the former "Two and a Half Man" star opened the show with a "big shout-out" to his children. "Daddy loves you, and if you're watching, tell mom to leave the room," said Sheen, wearing a black hat and black T-shirt with a neon dollar sign. "It's on. "Much of what he said afterward was unintelligible. 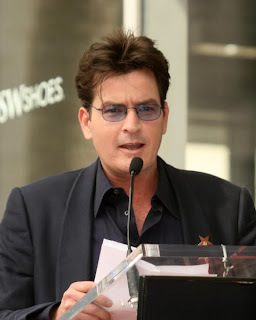 In one of his few moments of clarity, Sheen revealed that he got the word "Winning" tattooed on his left wrist.